All my extensions are developed under prosilver. And I don't test them under other styles. Sorry but with all the styles available around - I just can't handle it. On the question - yes it works ok with prosilver. Disable the extension and check if the error is still present. Might be something else that's causing it. Did this before i posted the issue, it is caused by this extension. Disabling all other Extensions also doesn't work. The issue is definetly caused by the Extension. Okay it is only a warning ist does not influence the functionality, but disabling the error messages is no enduring solution. It would be very fine if this message would disappear in the next version. What type of icon & color are you using? is it normal that there is no notification ? 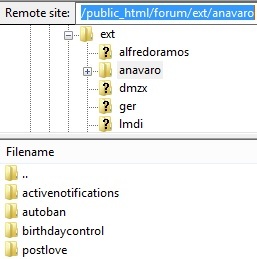 I installed this extension into ext/anavaro/postlove. When I enabled it, it worked as expected. I set the extension to not allow users to "like" their own posts. In "styles/all/theme/default.css", I changed all instances of "f004" to "f164" (solid heart to solid thumbs-up) and "f08a" to "f16a" (hollow heart to hollow thumbs-up). This successfully changed the icon. Due to the dark background of my style (Carbon), there was a bit of a visibility problem with the red icon. I changed the main color from ff0000 to ffcd94 in the same file (I left the mouse-over color of ff726c unchanged). This worked as well, and I believe it would work on light background. For other icons, the "FontAwesome" cheetsheet (http://fontawesome.io/cheatsheet/) might be of use. A quick scan found several possibilities. After the change to the thumbs-up style, I noticed that the "x" between the number and the icon was sometimes crowding the icon. I felt that it would look better without the "x", so I edited the files "styles/all/template/event/viewtopic_body_postrow_custom_fields_after.html" and "styles/all/template/event/viewtopic_body_postrow_post_notices_after.html", changing the "x" to "&nbsp;" (I wanted more space), twice in the first file and once in the second. This also worked. Previously in this thread (viewtopic.php?f=456&t=2246576&start=555#p14788371), the suggested file to change was "styles/prosilver/template/event/viewtopic_body_postrow_post_notices_after.html", but there's only an "all" directory in the version I have. Something must have changed since July. Still on this subject, I also noticed that the "x" was closer to the icon on my posts than it was on posts of other users. If this is fixed, the "x" will probably be far enough away. Someone might want to have a look at this minor bug. As with the previous poster, I did not see a list of users who had liked the post. This was previously reported as working. Was there a change in functionality or a regression problem? I'm using the "Carbon" style on a 3.2.1 forum. Note to developer: Could you please put together a list of links to user-developed tweaks, and add it to the first post? It would make finding these MUCH easier. About the all - yes. There was little file system optimization so it can be used for all styles. As per the list I think it only works on prosilver. As per the list I think it only works on prosilver. The Carbon style I'm using (https://www.phpbb.com/customise/db/style/carbon_2/) is based on prosilver. Is there any way you could test this out, and possibly look into making it a bit more flexible? The list would be quite helpful to me. I'll check it as soon as I can. The errors on line 4516 are likely to be a result of the error on 313 sending output and finishing the header. Concentrate on line 313. I just installed my new forum and wanted a simple like button, now I've found this post but where can i find the download button of the mod ? My version is 3.2 and installed the Milk theme, i hope it is compatible??? Can someone place the link for the download? where can i find the download button of the mod ? Can someone place the link for the download? Post results, maybe somebody will help. Als the normally registered people coudn't see the web page at all, looked like it was broken.